Grapes are often ignored in home gardens, and yet are one of the most widely produced fruit in the world—as well as beautifully ornamental plants. We have plenty of tips for growing grapes in your own backyard. Make sure you purchase grape vines from Oxfarm. Vigorous, 1-year-old plants are best. Smaller, sometimes weaker, 1-year-old plants are often held over by the nursery to grow another year and are then sold as 2-year-old stock. Grape farming has the potential to create employment and wealth among Kenyan farmers’ especially young farmers who are ready to try something new. Grapes’ growing is still in its formative stage even though there are grapevine orchards in different parts of Kenya that are more than 20 years old. More farmers and home gardeners should be encouraged to embrace this crop. Farmers can go an extra mile and establish wine making cottage industries that will improve the economic outlook of their locality. There is a lot to be done to ensure farmers are well trained on grape cultivation and value addition to guarantee high quality produce that will rival imported grapes and wine. The crop is a woody perennial vine having the ability, to live beyond 500 years. There are many grape varieties; they include, French grapes also known as Vitis vinifera, American grapes- vitis labrusa and Mediterranean/ Muscatine grapes. The most widespread grapes species is Vitis vinifera; a native of Europe grown on the world’s most land acreage. The crop prefers warm to hot temperatures; during fruiting, the weather must be sunny and dry. Warm environmental temperatures during fruit ripening, is important in increasing the sugar content of berries while reducing their acidity. This explains why grapes grown under irrigation in hot deserts or semi deserts are sweeter than those from cold humid areas. The crop can grow in any soil, from sandy to heavy clays but the soil should be deep and well drained. Where the rainfall is scant, supplement it with an irrigation of 500 mm of water during the cropping season. In Kenya, the cropping season is September to March. Irrigation should be withheld after the long rains to force the crop to go dormant. In August to September, fruit buds form thus it is important to keep the plant healthy and well manured. Plant dormant, bare-root grape vines in the early spring. Construct a trellis or arbor before planting. Grape vines will need to be trained to some sort of support to grow upward. This will also cut the risk of disease. Most grape varieties are self-fertile. To be sure, ask when you are buying vines if you will need more than one plant for pollination. Before planting grapevines, soak their roots in water for two or three hours. Select a site with full sun. If you don’t have a spot with full sun, make sure it at least gets morning sun. A small amount of afternoon shade won’t hurt. Your soil needs to be deep, well-drained, and loose. You also need good air circulation. Space vines 6 to 10 feet apart (16 feet for muscadines). For each vine, dig 12 inches deep and 12 inches wide. Fill with 4 inches of topsoil. Trim off broken roots and set the vine into the hole slightly deeper than it grew in the nursery. Cover the roots with 6 inches of soil and tamp down. Fill with the remaining soil, but don’t tamp this down. Prune the top back to two or three buds at planting time. Water at time of planting. In the first couple of years, the vine should not be allowed to produce fruit. It needs to strengthen its root system before it can support the extra weight of fruit. Pruning is important. Not only would vines run rampant without control, but canes will only produce fruit once. Prune annually when vines are dormant, in March or April. This is before the buds start to swell, but when winter damage is apparent. Don’t be afraid to remove at least 90 percent of the previous season’s growth. This will ensure a higher quality product. Remember, the more you prune, the more grapes you will have. In the first year, cut back all buds except for 2 or 3. Then, select a couple of strong canes and cut back the rest. Make sure the remaining canes are fastened to the support. In the second year, prune back all canes. Leave a couple of buds on each of the arms. Remove flower clusters as they form. Do not fertilize in the first year unless you have problem soil. Fertilize lightly in the second year of growth. Use mulch to keep an even amount of moisture around the vines. A mesh net is useful in keeping birds away from budding fruit. If grapes aren’t ripening, pinch back some of the foliage to let in more sunlight. Grapes will not continue ripening once picked from the vine. Test a few to see if they are to your liking before harvesting, usually in late summer or early fall. Grapes are ripe and ready to harvest when they are rich in color, juicy, full-flavored, easily crushed but not shriveled, and plump. They should be tightly attached to the stems. 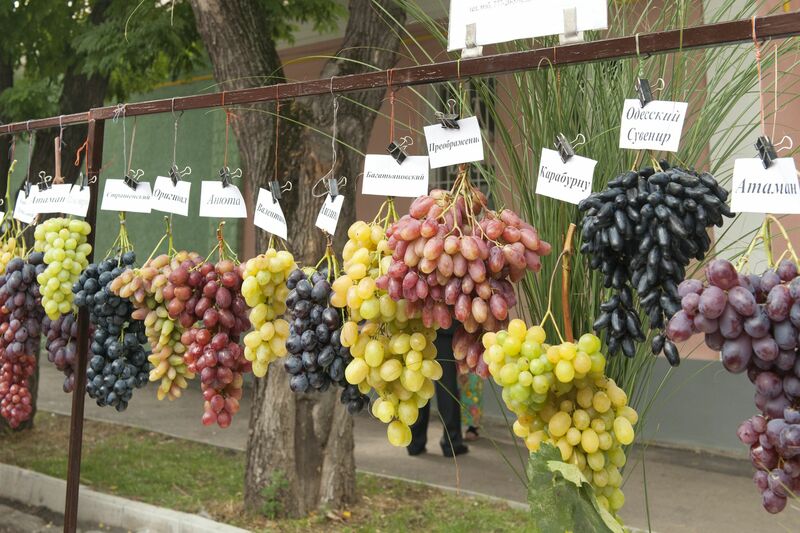 Sample different grapes from different clusters, and the taste should be between sweet and tart. Check our ripeness guide for more tips on color.